Ad Army Group was recently trusted to complete a thorough online overhaul for legendary musician and producer Michael Hanson, who made his name as a founder and drummer for 80s pop sensation Glass Tiger. Hanson has since moved on, electing to produce some of today's biggest songs and some of the biggest names in the industry. To get his message out effectively, he knew that the would need to rely on a company that could effectively blend great web design with perfect marketing and advertising tools. Every great artist needs to have a personal website that allows their fans, and industry sources, to get in touch with them and review their latest work in their field. As a music producer website designer with marketing sensibilities, this is the first approach we took while working for Michael Hanson. 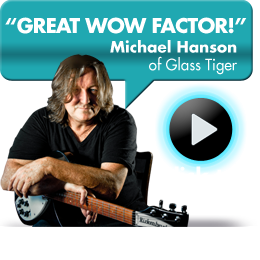 We created an exciting new design for MichaelHanson.ca that spotlights his legendary place in the industry, as well as his activities since Glass Tiger last topped the charts with a hit single. On the first page, we waste no time describing Hanson's achievements in the music industry. The right-hand side of the page gets to work describing the many awards the artist and produce has won during his career, and describes his most recent activity with links that can help visitors learn more about them. It's on the left-hand side of the page, though, that really brings the design to life. In today's era of video-heavy Internet usage, we understand that sometimes the best message on a website is the one delivered by its subject. We asked Michael Hanson to help us create content for his site in the form of a video, largely in an effort to appeal to visitors who would much rather watch content than read it. In the video, we spotlight Hanson's success in the music industry as an artist, and then we discuss his unique views as a producer. Since his time in Glass Tiger, Hanson has been a key part of Altravox Studios. There, Hanson is instrumental in giving emerging artists a platform. He has supported numerous artists creating their first studio album, and is a driving force in the local music scene. Hanson has also been a key part of many television and radio jingles, and our video content highlights his work in this area by talking to the man himself about his career. In addition to making a strong impression on the very first page of the website, our professional team knows well that the content on subpages must match the appeal of the index page. That’s why, as a music producer website designer, we got to work on interactive content pages that allow visitors to see and hear Michael Hanson's work and industry recordings. First, we created a page that showcases Altravox Studios itself, the home of many emerging artists that have worked with Hanson to produce their debut recordings. There, we talk both about Hanson's credentials in the industry and his approach to professional recordings in a video. We also discuss the studio's services and technologies in an effort to appeal to emerging artists. Finally, we provide a number of great recording samples from the studio using separate pages for soundtracks and advertising jingles. This demonstration of talent serves as a showcase for Hanson's work that simply can't be found using any other medium. By talking about the artist, his approach, and his work, and providing examples, we've turned the website into a key marketing tool that will dramatically boost business in the long term. In addition to creating a stunning personal website for Michael Hanson, Ad Army Group was also asked to create a new website for Cloverland Records. The studio serves as a collaboration between Hanson and Dave McCluskey. Like Altravox Studios, the label is dedicated to working with emerging Canadian artists, largely to get their music heard for the first time by professional sources and consumers. Our goal with this website was the give the music label a sense of urgency. We did this by crafting a well-designed and intuitive blog. News of the label's artists and approaches is posted regularly, enhancing the site's "freshness" in the eyes of major search engines like Google, and providing visitors with a wealth of information about the label. Every good blog has a useful sidebar, and the one at Cloverland Records is no exception. We wanted to showcase every single artist that currently calls Cloverland its home, and we created a jQuery-based sidebar element that links to biographies of each of the label's emerging acts. The same sidebar elements links to available downloads from each artist, increasing their visibility and the label's overall reach. Tour date information, as well as an online shop, was also highlighted by our designers as part of the site's major overhaul. Using a quick sidebar link, we even made it very easy for visitors to get in touch with the label and arrange anything from a studio tour to a recording session with Hanson and McCluskey. At Ad Army Group, our core philosophy is that good design and good marketing are intrinsically linked together. That's why each website we design serves as a holistic way to better know the person or business represented by the site. Videos, biographies, and useful examples of products and industry work, all serve to enhance the position enjoyed by Hanson's websites. They more effectively communicate a cohesive message with visitors, and they're able to rise in Google search results with regular updates and fresh content. With vivid colors and a professional appearance, the finishing aspect of each design is its ability to dazzle the eyes as much as it informs the mind. That's a commitment to future growth and information that we think is essential in today's very competitive online marketplace, and it can only be found at a firm that blends a designer with a marketing consultant on every project. You have now seen some more great work. Pick up the phone and call Paul Cookson at 416-286-2860 and HIRE AN ACE to help you with your Marketing.